In all the chaos of Times of India coming to town and Babush's attack on the Panaji town police station a tender ad placed by the Goa Police SP Head Quarter Allen D'Sa slipped by. Did any of you notice it? The tender called for quotations from interested parties for a few hundred cartons of cotton ear plugs. You guys missed it too? Do run a check on the newspapers. You'll get it. You see, maybe the cops don't wanna get caught flat-footed again. When Babush attacked the police station, they found themselves woefully short of riot gear. Now they wanna be ready for the next assault which has been unleashed on them in form of the 'blah blah' maestro Glenn Costa. 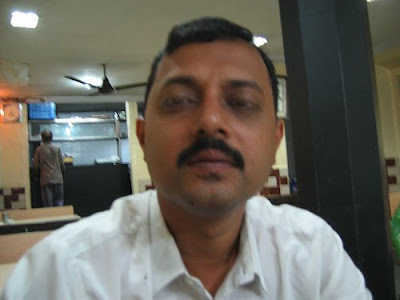 Glenn replaced Jamauddin Sheikh as The Navhind Times crime reporter recently. The cops had better ready up and start getting used to ear plugs. The sooner the better. Cause when Glenn starts talking about himself and all else he is 'privy' to, nothing stops him. Here's a tip for these poor unsuspecting cops. This is a small incomplete list of giveaways... Those salient points in a conversation, when Glenn is about to launch on his gabbing spree. So why has TNT changed its fellas on the Crime beat? The official reason is that the editor was disappointed with Jamal's coverage of the recent fracas at the Panaji police station. Hmm... After more than six years of below par, less than ordinary, revolting coverage of the crime beat, the uncrowned patron of mediocrity Arun Sinha, finally realised that Jamal's reporting skills weren't up to scratch. A below-the-skin reason is Glenn's steady appropriation of Umesh Mahambrey's 'Yes-Sir-Of-Course-sir-You-Are-Right-Sir' role that has only helped matters. So here's wishing the cops good luck. And luck to you too Glenn, put ears where the crime is and your mouth far away from it. Learn to listen, thats half the job done man. Presidents of the most powerful nations don't. What's the use... sleep deprivation, diabetes, sleep related disorders and finally... death. All humans die don't they? We seem to live in a culture that works too hard and then leaves EVERYTHING when they die! It's cheaper than wasting money on buying seldom used riot gear. Goajourno is full of a British girl murder. The classic case of cut and paste Journalism which some greats in Goa are known for. Attacking a person who cannot defend himself is the very lowest form of journalism. Umesh Mahambre may have said "Yes sir," a little more often than he should have, but he was an upright and very hardworking reporter, apart from being a talented playwright himself, with a deep involvement in cultural activities. Who is this Glenn chap. Is he the new find of Arun Sinha. Never heard of him anytime earlier. He looks more of a worried person in this pic that you guys have displayed. Must be still trying to come out of the ordeal of 19th February. He must have gone to cover the happenings. Watching the scene out there must have shed bricks. Glenn boy time to learn some lessons about crime reporting. Be a shoulder boy of Franky from OH My Herald.